Blog » Mumbler in the local news! Mumbler in the local news! We would like to thank the Stockport Express for their article about Stockport Mumbler in this week’s edition (7th December 2017) of the paper. A ‘MUMPRENEUR’ has launched a new online guide to help Stockport parents easily find family friendly services. Heather Smith decided to embark on a new career with Stockport Mumbler as being a mum herself, she found it difficult to search out the best places to go with her two-year-old daughter Georgia. The 28 year-old has now set up a one-stop shop for everything parents might want to know about living in Stockport with young children, and her venture is already proving popular with other mums, dads, carers and grandparents across the borough, with more than 6,500 visitors to the website in its first month. Recommendations for child-friendly places to eat, photographers, favourite retailers and tradespeople and much more can be submitted, mums and dads can also use the site to sell their pre-loved baby, child and maternity items, and their is an opportunity to write guest blogs. The site includes an up-to-date events calendar, weekly listings of classes and playgroups, days out, childcare, competitions, antenatal classes, jobs for parents and much more, along with opportunities for child-related businesses to promote themselves. 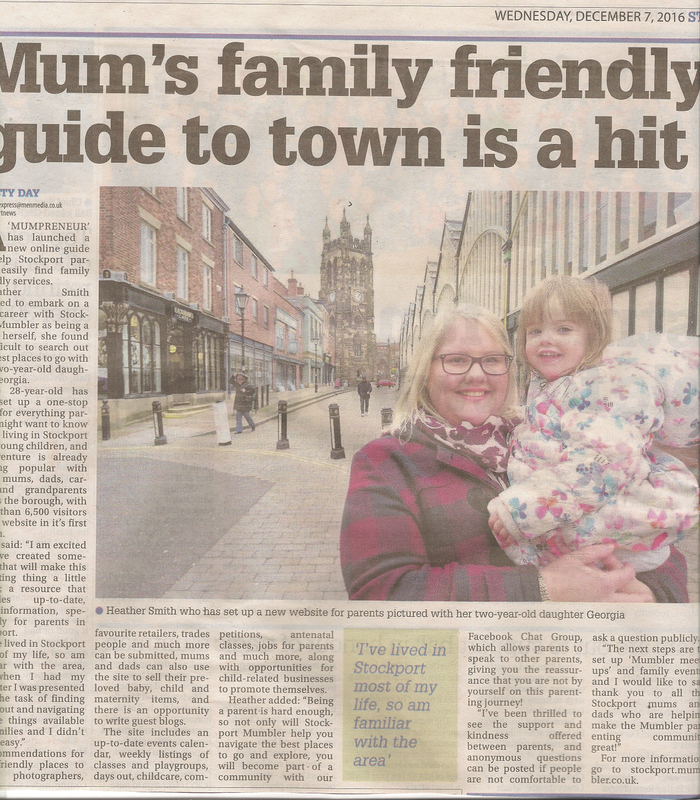 Heather added: “being a parent is hard enough, so not only with Stockport Mumbler help you navigate the best places to go and explore, you will become part of a community with our Facebook Chat Group, which allows parents to speak to other parents, giving you the reassurance that you are not by yourself on this parenting journey! “I’ve been thrilled to see the support and kindness offered between parents, and anonymous questions can be posted if people are not comfortable to ask a question publicly.